After towing a 39-foot horse (llama) trailer for 12 years of vacations including a 6-month full-time sabbatical and after we had an empty nest, in June 2012 we decided to have built a custom class-B (van-based) motorhome suitable for two people. We wanted access to small forest campgrounds, good mileage, the convenience of never having to hook up a trailer or towed car, access to the living space while driving, and the ability to park almost anywhere. We chose the Mercedes-Benz Sprinter, a van that I can stand up in which gets 18-20 mpg and is 7 feet wide and 23 feet long. To build the interior we chose Sportsmobile, Huntington, Indiana. The interior was completed in January 2013. About 4 months of the wait was for the Sprinter to be built in Germany, shipped to North Carolina in crates, then reassembled. We named her Vanessa for "Van odyssey". Our uncle Den, who named his yacht "Dovekie", told us that seven letters and a repeated vowel bring good luck. I hope this works as well for us as it did for him and not like it turned out for the Titanic. There are comments by me (Llamadave) and others on the Sportsmobile Forum. Click here for Vanessa's complete building experience. You can also comment and ask questions at the bottom of this page. Did you consider adding the pop-top? No interest in a pop-top for us. I am 6'2" and can stand up in our van. It is nice to walk to the back on short stops and even when underway. Hi David. I recently dropped off my MB Sprinter, 144, low top, to SMW. I am going w, a penthouse bc need 2 sleeping areas. Otherwise, I am running out of space to fit everything I want. I need suggestions for compromise. I'll be traveling short and long trips cross country. To make room for interior AC, since it wont fit on roof, I had to sacrifice my indoor shower and black water tank. Instead Im using Laveo dry flush toilet and outdoor shower. Im wondering how much the AC will be used, especially if boon docking w/ no generator. Maybe I should keep the full bath instead of AC? Also how thick is your mattress? Does it require a topper? Do Where do you store it when bed is converted to seating? Thanks! I saw your message and will throw in my 2 cents. We've have a SMB van for about a year now and got an AC on the roof. We have almost never used it. I got it because I thought it would give us more options and help with resale, but if I had it to do over, I probably wouldn't get it. We don't have a generator and many of the campgrounds that we've liked to stay at don't have electricity so we wouldn't have been able to use it anyway. And we travel for pleasure, so if it is too hot to be comfortable, we will travel somewhere else. On the other hand, we use the indoor shower a lot. We got a relatively large shower, though, so if yours is not big enough, you might not use it much. Depending on just an outdoor shower would be a hassle for us (mosquitoes, rain, cold weather, the mess of walking on wet, muddy ground, privacy in some situations, etc.). I didn't know anything about the dry flush toilet you mentioned so I looked it up. A very neat piece of engineering. Not to discourage this product at all, but my concerns would be: (1) sourcing replacement cartridges in the long run. The cartridges look proprietary so if the company disappears, you've designed a key part of your van around something that won't work anymore. (2) Cost of cartridges (I'm a cheapskate and would calculate the cost of each flush - an issue you don't have with a black tank). (3) Noise of flush at night if you have a partner in the van. On the plus side, it seems very sanitary and odorless and you could dump it in any trash can. Very good advice. I will seriously consider whether I need the AC! Thanks so much. Hopefully the Laveo wont go out of business, however, I will stock up on cartridges for sure. At the very worst, it will be a very expensive bucket and bag system! Thanks! Rolo, sorry I missed your questions. I hope your build turned out good. We have used our A/C only a few times, but it was very good to have when needed in Zion in September for example, over 100F in the day. However, our full bathroom is much more important. Our dinette seat cushions become the head end of our bed, about 6" thick. The foot of our bed is 4" thick and stays there all the time. Hey David! I love what you've done with the Sprinter. I've recently bought a Sprinter as well and doing some research on how to easily have a nice table by the swivel seats. Could you give me some more information on how your table is build? Especially what its supports are, because I can not see it clearly from your pictures. Nanouk, I have some more photos and a diagram with dimensions that I will now post on my blog. Look there later today. Thanks much David for the response on your water pump. I installed the 2.3 gpm version and was out this past weekend. Works great. Since I'm looking at the water system I noticed your use of Tempering Valves. Now that I have some experience I think such a valve would be very helpful as I'm using a lot of water adjusting the temperature, particularly the shower. For the valve at your hot water heater...did SMB mount the valve on a wall, as they did with the one in the back of your van, or is it simply located in the lines and otherwise free standing? The tempering valve is mounted on the left side, inside of the cabinet that contains the hot water heater, behind the driver seat. It is mounted so the red control knob is facing out and easy to adjust. We have been very happy with this, especially for showers. I am also installing one on our house bathroom and kitchen sinks. I will post a photo on the Vanessa photo page soon. Wondering how satisfied you are with your Shurflo Whisper King's flow rate of about 2.0 gallons per minute? I have a 3.0 gpm model which has started leaking so I'm looking at replacing it. To make a long story short I ended up ordering a 2.3 gpm version. I have a sink, hot water heater and a shower in a 144 wb sprinter with all water lines on one side of the van. Conserving water is important as I only carry a total of 25 gallons fresh water so thinking this will help. We are happy with the 2 gpm flow rate. In fact, we have a pressure reducer after the accumulator tank to reduce the flow to the bath sink and toilet and hot water, to save on water use. The galley cold water (on the other side of the van) is not reduced and it has a very good flow rate, higher than we need. I should add that this flow rate is not enough to give a good flush in the toilet. We keep a spray bottle with soapy water near the toilet to clean the bowl. Another consideration is that a faster pump will fill the accumulator tank faster so you hear the noise for a shorter time. In fact with an accumulator tank the flow rate at a sink is more a function of the highest pressure not the pumping flow rate of the pump. I am just starting to research van conversions in anticipation of retirement, I don't know much. I like the idea of a custom conversion - not sure it will save money, but buying features line-item-wise gives me a much better feeling that I know what I'm paying for. I have been looking at Sportmobile / playing with floorplans for a couple weeks now and found your site via a google search for reviews. Great site - thanks for taking the effort to compile and organize all this information! I like the idea of a pop-up roof for the bed. I am thinking we can have a larger galley and bathroom than we might otherwise and also have some more storage (deeper rear storage area) than if we needed a queen sleeper below. Did you consider and reject a pop-up roof (do you have any cautions against one), or was it never something of interest to you? For 10k, it seems like relatively inexpensive usable space to add to the inside. If you have any perspective on how useful it might be, I'd appreciate it. Sorry about the very slow reply. With the longer Sprinter we have plenty of room at ground level and do not look forward to a climb up to a loft at the end of the day. 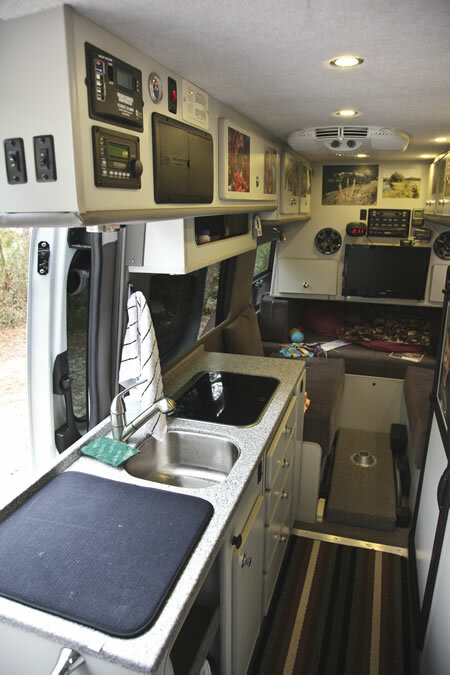 Our combination of 70x82" bed, dinette, and rear storage has worked very well for us. We have had constant problems with our Sportsmobile. 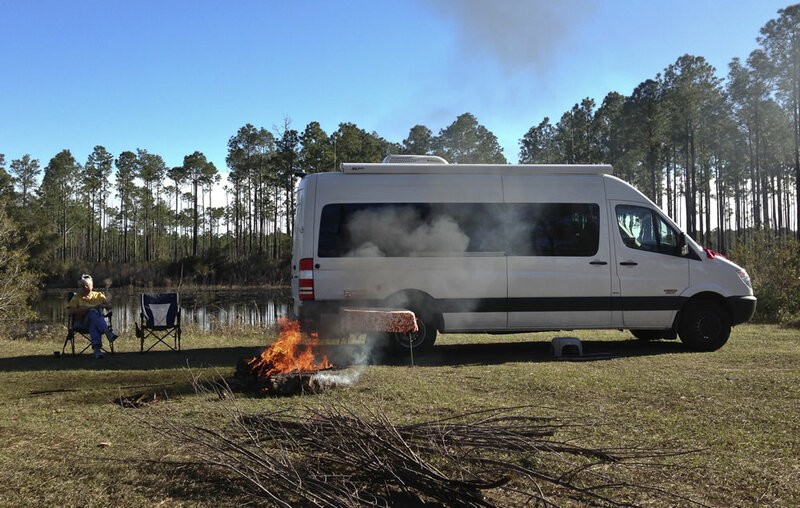 Some of the problems are with the camper portion and some of the problems are mechanical Mercedes Sprinter problems. Too many to list. Feel free to contact me and I'll send you the list. More of a saga really. I would like to hear about your problems. You can post here or use my contact information above. Great fotos, great trips, tons of inspiration! We are planning out the interior/exterior considerations for our Sprinter 170, 4×4. It seems that we keep falling back to a vital comfort for us will be the comms, audio, navigation and lighting schemes. We’re more listeners than we are watchers, a TV is low on the plan right now. We want to load ourselves up on this end versus an extra cabinet here or a not positive we need it item there; as laymen relative to electronics/wiring and antennae we’re always seeking the clearest line towards having this side covered. How do we navigate these needs with SMB? Just give SMB a call! They will help you find an installer. Why did you select the particular toilet that you got? Are you happy with it (or as happy as you can be with a toilet). Also, what kind of wax do you use on it to help keep it clean. The toilet works great. We had the same one on a prior RV and liked it. It requires good water pressure and pretty much water to keep it clean, so we wax the inside of the bowl (not very often) with just car turtle wax. Then we keep a squirt bottle of soapy water handy for a "manual targeted flush". I probably need to explain with more detail. A flush of the toilet handle opens the valve and lets most everything go down the hole. You do this quickly so as not to use much water and to not let much smell enter the van. Then you may find feces on the sides of the bowl. You get these with the spray bottle and usually another flush is not needed until next time. With this system we can even turn off the water to the toilet if we really want to save water. It does help to add some water by pushing the flush handle part way before using the toilet. Not sure I already said we do not put toilet paper down the black tank. If you have not had an RV before, you will need to learn to live with the smell, especially bad in hot weather a few days after dumping. You need to add lots of "black water chemical" available at Walmart. Also run the fantastic vent fan blowing in when flushing to push the air down the hole and up the black tank vent. In your equipment list, you have an Ameri-Kart combo shower pan M2835TW. I went to their website and see that the standard shower pan that comes with this (HT529) is 7-inches tall but that you went with a much larger tank (HT486) which I see is 8 ¾-inches tall. So am I correct that this raised the shower pan (and reduced your ceiling height) by about 2-inches? I saw some pictures of what looked like a custom box to hold the shower pan and tank and I figured that this was to make the tank fit the pan. Thanks. Yes, I think it is up by about 2 inches. I am usually bending over the sink or sitting on the toilet so the ceiling height is not a big issue. I am not sure but I think there is not enough room for a trap on the shower drain because if we don't keep the drain closed we get some smells from the gray tank. I have a question about your winterizing procedure relative to the accumulator tank. You said, "The accumulator tank … does not require any changes to the pink-liquid winterizing procedure since it is completely empty when there is no pressure in the system." Then, in your winterizing procedure, you said to "...run pump for about 20 seconds to fill accumulator tank" with pink liquid. Could you clarify this. It seems like you need to use two gallons of pink liquid just to fill the accumulator tank. I guess that as you open faucets to fill all the lines and traps with pink liquid, it will drain that down. Related to this: Could the accumulator tank be mounted vertically (with the inlet facing down) so that it drains completely when the system is drained, then close it off with a valve and fill the rest of the system with pink liquid leaving the accumulator tank empty? You are correct, the accumulator tank empties when you open the faucets to move pink liquid through the pipes. Even if the tank is not completely empty, it and the line up to it will have pink liquid so no worry about freezing. Experience has shown that it takes about 1.25 gallons or under $5 to winterize. Another question: You said that you installed a momentary switch on the dashboard to close the separator relay. But you went on to say, "“We can close this switch and it will stay closed until the battery is mostly charged from the house batteries.” I am quite naive about this stuff, but doesn't a momentary switch only activate while you are pushing it? How could the separator stay closed if you're not pushing the button. Also, why would you need to charge the van battery from the house batteries. If the van battery is low, couldn't you just push the momentary switch and immediately start the van and then release the switch? Thanks again. Good question. Normally you will never need to charge the van battery. If it runs down for whatever reason (Search for Ultragauge and separator on my equipment page) then you push the button which is momentary, but if the house batteries are higher than the van battery, the separator will lock closed so the house battery will charge the van battery. You should start the generator first if you have one. You need to charge the van battery this way for say an hour before trying to start the van otherwise the house batteries will be connected to the starter through the large 2/0 wiring cable and will blow the big 30 amp fuse that is below the floor in front of the driver seat provided by Mercedes. We learned this the hard way. Thanks Dave. It took me some time to digest this, but I think I understand. On your "Driver Side" and "Passenger Side" drawings, you allowed 36-inches between the top of the dinette seat and the bottom of the overhead cabinets. I would certainly like to maximize the cabinet height to maximize storage and was wondering if 36-inches worked well for you? Thanks. The actual distance turned out to be 34 and this distance worked just perfectly for me (I am 6'2"). The bed ended up about 2 inches higher than the drawing shows because they needed more room for the water tank. The space for our feet is also about 2 inches less. The lights under the cabinet stick down about an inch and you sink into the seat cushion an inch or two. My head misses the light unless I really stretch and straighten my back I can barely hit it on the top of my head. I see on your electrical plan that you installed nine recessed LED lights in the ceiling (in addition to many other lights). Has that worked out well? Bright enough? More light than you need? Do you know the wattage of the LEDs? Thanks. We do use all the lights, although never all at once (except maybe to take photos). I am sure we could have gotten along with fewer lights, but it is very convenient to be able to reach a light from anywhere when you need it. And to use only one small one over the counter when the other person is sleeping. The 9 recessed lights draw 2 amps total (24 watts P=IV) and one under-cabinet light draws 0.2 amps (2.4 watts). We don't need the 9 overhead lights much so this is a much lower power user than the fridge. Note that I used the battery monitor to get these numbers. Are the 9 ceiling lights on a single switch or can you operate them each separately? I assume the reading lights can be individually controlled? Thanks. On your equipment list, you note gauge 2/0 welding cable to go from the separator to the batteries but your electrical plan calls for 1/0 gauge. What did you end up using? What is Sportsmobile’s standard and was it an issue to ask them to upgrade? Are there any other places where heavy gauge wiring is important? (Maybe from solar panels?) I don’t know much about electrical wiring, but just want to know what to ask for from Sportsmobile. Thanks again. SMB North actually chose the 2/0 cable. They knew I wanted big cable. The 1/0 probably would have been fine. The only other place for big cable is the charger/inverter to the batteries and the battery ground cables. The big cable keeps you getting a voltage drop which would reduce the charging current to the battery. It is less important to use heavy cable for lights since the LEDs are still bright after a voltage drop. Same for fridge etc. The big cable is harder to install and expensive (lots of copper) so you might get an extra charge if this is not standard. I think I understand this. Thanks. I have so many questions, I hope I don't drive you crazy. My next question: You have a Camco grill attached to the side of your van. Does this affect the van in any way? I'm curious if the heat could affect the van's paint? Also, did Sportsmobile install the brackets for this or did you do this yourself? Thanks again. The grill does not heat the van. When you raise the stainless steel lid, it shields the grill from the side of the van. You do want to close any windows near the grill to keep smoke out of the van. I installed the bracket. The only downside to this is that you might get some rusting on the mounting holes. Make sure they are stainless screws and apply some caulk to the holes before mounting. So Sportsmobile really didn't get involved with this at all? I only asked them if this was a reasonable place to put the bracket. They did, however, install the propane tap in that corner. On your equipment list, I see that you got the standard Magnum MS2000 inverter with “Battery remote Magnum ME-RC50”, which I believe is also standard. You also got the optional “Battery monitor kit Magnum ME-BMK”. Does this have its own control panel or does it provide more information to the ME-RC50 panel? What does the ME-BMK do that the ME-RC-50 doesn’t? Do you find the ME-BMK useful? Having used it now for a while, would you recommend getting this? Thanks. The battery monitor provides lots of additional information and I find it very useful. Trouble is that SMB North did not wire ours properly. It uses a shunt on the ground connections to measure current draw. On ours not all things were connected to the shunt, in particular the inverter was not. When everything is connected, it will give you the charge status of the batteries. When you turn everything off except for one thing such as a light, it will give you the current draw of that item. So you can figure out where your power is going. We use the voltage to tell us the charge status and we try not to let it get below 12V. Dave, been enjoying your information on your sprinter build. I have an 02 E350 2WD and am planning a interior build. What size plywood floor do you have and what size is most of the wiring for lights etc. Do you have an opinion on the olympic3 propane heater? Heat in colder weather is my main concern. Water is going to be 1 gal. jugs, 3 batteries for a 2200 mod. sine wave inverter. Portable gen. for power, may consider solar, debating on portable unit. Any suggestions appreciated. I think the floor is 1/2" plywood, but I am not sure about this. Also not sure about the wiring, but it was pretty large, perhaps 12 gauge. My only comment about propane heat is that in cold weather you will be filling the propane tank very often. I would go with the Espar D2 diesel heater. I have been struggling with making a decision about a Sportsmobile Sprinter. Your website, details re Vanessa, and much useful information have excited me and made me laugh for the first time during this RV pursuit. Added to that, my daughter and her husband went to undergrad at CWRU! I am in conversation with sportsmobile Fresno to convert the new 2015 Mercedes sprinter 4x4. My intent will be to live in it full time. Currently I work in LA two days and then drive to the seasonal area to rock climb when not in LA. Renting RV park space in LA and moving to the campsite or a RV near climbing area seems to make more sense than paying high rent for an apartment that I am in half time. Additionally, I want my cat to be with me wherever I am. Mostly it is about my cat! My question--so I can easily park I am looking at the RB w/pop-up bed. Would be fully loaded with everything needed. Only me and my cat would live in it. I am 5'6" she is about 12". I do like small places, apartment is a small studio and I sleep in a converted jeep wrangler when climbing. Having experienced the van shared with another person what are your thoughts about one person living in it full time. I know it is a personal thing but would like your insights on how roomy it feels inside. BTW--was worried about the shower, your great explanation really helped! Lori, After our 3-month trip to Alaska I can report that our EB, high roof sprinter would work well for us full time. With full windows except the back we don't feel too closed in, and have spent many rainy days inside the van all day. I do not have experience with a pop-up bed in a low roof Sprinter, but we really like to be able to stand up for short rest stops. For full-time I would definitely want a generator, large fridge, and full bathroom with black holding tank and shower. In short, for full time I would want all the things listed on this site. The EB size van should not be a parking issue, I think only a cost issue. For one short person instead of two, the bed and dinette could be smaller. I would still take an EB over RB for full time to fit the full bath and kitchen, so you should consider that carefully. Yes, the skid wheels protect the generator when there is a sharp dip in the road. We have hit them several times when exiting a place of business. I seldom back into a drive but they protect for that also. I purchased these heavy-duty wheels and welded them to the bottom of the Mercedes hitch using a short extension tube. They stick down far enough so that a when you place a straightedge from the bottom of the skid wheel to the bottom of the rear tire, it misses the bottom of the generator by an inch or two. To charge the batteries you need a converter. The directions that come with that will explain. There also needs to be a relay that separates the generator from the input from city 110V power. SMB did all this for me so I am not sure of the details. Hi David...can't wait to take a trip to Alaska! I have been there before and consider it to be one of the great places on earth for many reasons. I'm dropping off my Sprinter next week at SMB North...so getting closer. I have the Wilson amp so if it's not to much I'm interested in how you connected it into the 12 V system and also same question on charging the phone. Did SMB do this? I haven't checked, but is there a power source in the DIN 1 above the cab area? I'm sure this isn't complicated, but my background is Finance, not Physics. There is power from the Sprinter battery in that DIM slot, but I wanted to use power from the SMB batteries, so I ran a wire from a free fuse location in the SMB fuse box, located over the sink, to the DIM location, going above the ceiling. I put a switch in that line so I can turn it off. I also ran the 12V power for a Kenwood radio on the dash and to extra 12V outlets for charging iPad and laptop. David: We're close to taking possession of a Sprinter Class B RV (not a Sportsmobile, tho) that we are buying direct from the manufacturer. We also have State Farm and they will be insuring it as an RV. But when we called the State BMV they said we could register it either as a passenger vehicle or as an RV. Passenger vehicle excise tax is a lot less than an RV, so leaning that way. How did you register your Sportsmobile Sprinter? Any advice on this issue is much appreciated. Please provide source for 4G antenna. Is it in a radome? I got the booster and antenna from 3gstore.com. My antenna is Wilson 21" Omni RV Antenna w/ Spring Base. Also available from Amazon and other places. How did you handle insurance between the time you purchased the vehicle and had it at your home and got it to SMB? I'm struggling to find anything. Hi Tim, we insure with State Farm and they were happy to insure our empty panel van starting when we picked it up at the dealer. SMB did not bill us until it was complete so their insurance covered the work in progress until we paid and picked it up when done. State farm just needed to know what we paid SMB then they insured the total package when we drove it home. I'm in the final stages of preparing my plans for a SMB 2500EB conversion. I see on your plumbing diagram that both gray tanks share a common drain and valve. Is this something SMB did for you, or did you do the modification? Any additional details would be appreciated. This website and your forum posts have been extremely helpful. Thanks! SMB Indiana connected the two gray tanks. The left tank is lower than the right one so they both drain to the slinky drain hose on the left side. They tee into the black tank line and the drain hose is always connected so all I have to do is stick it down the hole and open first the black valve then the gray valve, then push the hose back into its holding pipe. I heard that the 2014 Sprinters are lower and so this plumbing system may reduce your clearance to an unacceptable level. We have not grounded the plumbing yet but I have worried about it several times. Note that the gray vents are on the top of the tanks, below the van. If you over-fill them, the water drains out onto the ground. Several times I have experienced a sewer smell around the van -- not sure if it was the gray tanks. Glad to hear my writings are helpful. Let me know if you have more questions. David, we still debating whether to purchase new sprinter conversion van from a dealer or go with the "Sportsmobile" custom build with one power source (no LP) rig. What is the really quality build-out not via watching the youtube videos. We are more or less 1,200 miles from that IN, location so, how you can be sure everething going to be build perfect. There is always a disconnect between what a contractor thinks is acceptable and what a customer thing is? Please advise. I recommend you should visit Huntington at least once or twice. Also, ask Nancy to send you photos. You will be ok if your build is not too different from their demo or another SMB you have seen. I gave SMB very detailed drawings and visited many times (2 hrs drive for me) but my build was very different. Keep in mind custom builds take a long time, especially if you order a custom Sprinter, made in Germany. Have a quick question, but first, I checked out your Travel Blog. Great design and Trips too! Hi Tim, We drink water from our reverse osmosis filter at home and are used to the taste, even though our tap water from a well has tested ok. We take about 6 gallon jugs of that with us camping. We use that for everything in food and drink. There are several advantages: 1) taste, 2) don't have to disinfect tank, 3) increases our on-board water capacity, and 4) never have to worry about water quality when we fill the tank. However, we are not paranoid about this and wash food that will be cooked with tap water. We buy pre-washed salad greens. We brush our teeth and wash dishes with tap water (unless we know the water is likely bad such as in Mexico). When we run out of jugs we buy more at a grocery. My wife and I are empty nesters and we are going through the steps of see how and if we can survive in a smaller RV. I really like your layout and it seems to have what we want. Now that you have had it, would you make any changes to the next one? We are very happy with the layout and would not change anything. There were some problems during the build, and some things that I did later that maybe Sportsmobile could be convinced to do, at maybe a high price. Have you read all my posts on the forum? They talk about most of these issues. I am still not sure if maybe we should have had a propane refrigerator. When dry camping (most of the time for us) the fridge uses a lot of battery power and was the main reason I had to install two more batteries. Also it is noisy. If you use my drawings, which you are welcome to do, there are a few things here and there that are an inch or two or three that are different. I really should go over everything and make the drawings agree with the build. I hear the 2014 Sprinter has 3 cm smaller ground clearance. This will be a bigger problem for the diesel generator and gray holding tanks. Where are you? Would you have Huntington build for you? You should definitely come see Vanessa. Or maybe we will be heading your way sometime. We are in West Lafayette, Indiana. David...awesome Sprinter with some great ideas to make it even better! I thoroughly enjoyed reading about it. I'm going to have SMB North do the work on mine also...though a 2500 with 144" WB and I'm trying to avoid putting on a Generator. One follow-up question which could help me with some design thinking is prompted by a comment you made on the SMB Forum. At the time, early after your build was completed, you had not yet had the opportunity to run the Dometic AC with the alternator while driving the vehicle. How did it go? Does your Alternator keep up with the drain on the House batteries as the inverter pulls out power to run the AC? I tried running the A/C on the inverter and alternator. It worked but the weather was cold and I am not sure if the compressor was actually running. I will test again when I have some hot weather. We are finally in hot weather, 85 in southern Florida in February. Our A/C will not start at all with the inverter and batteries. I have 4 batteries and they were all charged and the engine was running. When driving we are plenty cool up front, but the back did not cool well, not a problem for the two of us. With more people in the back we would run our diesel generator for the A/C. Hello David, Congratulations to your new dream van. I got mine also, except it is a work van I'm changing into something like you have already. Now, after lots of parts purchases I'm thinking, maybe this is a too large project for me to tackle. The million $ question therefore is this: How much did you have to pay Sportsmobile to do the transformation? Are they flexible enough? For instance I do like the idea of Espar air and water heaters, but it seems there only a few enthusiasts who do install them. (I installed the air heater myself.) I would like a diesel cooktop instead of the usual propane stove. For water heating I'd like an Espar water heater that would preheat the coolant also. I would like a shower, but I want no black water mess, so I got a composting toilet. My van is extended (24 ft total) length. Let me know what is your opinion. Best regards and congratulations, Peter. Hi Peter, Sportsmobile can do most of what you want but they abide by the RVIA standards and so can't do some things. Their prices are on their web site or you can call them. They will probably use any parts you have purchased and subtract their cost for the item from their price. All you need to do is talk to Nancy at Sportsmobile North. H Peter. I'm just beginning the design of a conversion of the extra long high roof 4x4 sprinter. I saw you used a composting toilet. I'm trying to research toilet options. I've never had an RV. It sounds like with a black tank there might be a smell. I met someone the other day who had a cassette toilet and a door in the side to pull it out to dump. Seemed easy. I also watched a video on the Advanced RV site on toilets. They seem to like composting toilets. Do you have any advice. I'd appreciate suggestions. Thanks. Thanks for the tour of your new home. It' s great to see the plans. Love all the diagrams and description! Thanks for posting. Enjoy your new Sportsmobile! 1. What do you think about solar panels to charge batteries? I have 3kW grid-tie at home (14x225w). Works fine, planning to install panels on RV, curious what travelers think. 2. You mentioned noisy AC. I have the same concern. Did you look at other options? Any thoughts? As an AC I'm looking for inverter AC, but so far cannot find the one for RV. I compared (use at home) regular mini-split (full on/full off) and inverter based split (variable compressor and fan speed). The difference of power consumption is significant (1.2kW regular split vs. 0.5-0.7kW on inverter-based AC) and inverter-based AC is very silent. 1) My solar panels are designed mainly to provide power for the electric refrigerator. They are not ideal since they are horizontal and we will often park in the woods. 2) I plan to wear silicon ear plugs at night, especially when the very noisy generator is going. I think the Penguin A/C is a good choice. I do not plan to use it much with the inverter (not good for the batteries to run them down so much). Hi David. Thanks for answers. Sorry, I thought you tried M2835TW. Btw, do you know that Sprinters (I saw 2007 model) have option - Mega Roof (84-inch)? I can stand up in the middle, but the shower pan is raised to make room for the trap. I did see the shower pan today and will post photos on the SMB forum. My bath is 24x48. Although the shower pan is smaller, you have arm room above the sink and toilet so I think it is plenty large enough. > I do not plan to use it much with the inverter (not good for the batteries to run them down so much). Hi David, great RV, lots of great ideas. - 1. your Black and Grey tanks are connected and bath tub drain is below the Black tank level. Any problems? - 2. how do you like the size of your shower? I'm also planning to use M2835TW and curious if I can get used to 38"x23" shower. Btw, thanks for detailed plans. I'm also planning to build an RV on 170"WB Sprinter. After experience with the shower I can report that it works fine. It was a little weird sitting down on the toilet seat cover, but I got used to it real quick and no problems. You stand up and lean over to wash and rinse your bottom. You have a good suggestion, but the trouble is that I am 6-2 and have one inch clearance above my head in the SMB Sprinter. The A/C sticks down a few inches and so I do not want it in the hall or up front. When I have to run it over night I use earplugs and have a warm comforter. I use Macks Pillow Soft Silicone Earplugs which you do not even notice when sleeping. Since we mostly dry camp, the generator needed for the A/C makes much more noise than the A/C. The tinted glass in the back should not pass the infrared rays from the sun and not heat up the van. Thanks for the tip about Fanchers -- I will read more about them. Hi David, we have an 2012 SMB West PH camper (spenard@sportsmobileforum.com). Thats quiet a ship you are building. I Like your detailed plans and have only a couple of comments for consideration. A/C unit location right above your dining and your heads sleeping - will that be too noisy and drafty (with the back bulk head unit the cool air will be forced to fall on you for better or worse)? why not move it forward to spread the cool evenly? split up the solar panels to make room? Also you have a lot of glass (if I read your diagram correctly) on the driver side. You may want to incorporate some sort of external awning on that side to reduce solar gain on glass and the refrigerator zone. Fancher makes a great external windshield solar screen for sprinters that also works as a daytime privacy one-way screen for the windshield. works great (see our gallery pics for an image of it). Love the screen door and may do that retrofit to our \\\"moose\\\".